Cantaloupe, Watermelon and other melons are high Vitamin A, Vitamin C and even Calcium. The cantaloupe has an amazing concentration of beta-carotene making it a must have for healthy vision and eye development. Just 1 cup contains approximately 100 % of the USRDA for Vitamin A. Melons are a healthy and nutritious fruit option for your little one. Soothing and watery, full of beta carotene, melons are sure to be one of baby’s favorite foods. 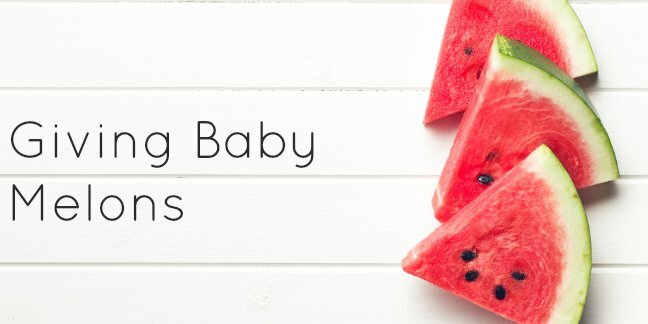 When Can I Introduce Cantaloupe, Watermelon and Melons to my Baby? Cantaloupe and Melons may be introduced to baby from 8 months of age though some introduce it as early as 6 months of age. Please be aware that some babies may experience rashes from melons of all types. If your baby has a rash that maybe traced to melon, this is most likely due to the melon’s “acidity” and not to an allergy. As always, we encourage you to consult your pediatrician about introducing foods to your baby; generalities may not apply to all infants. Hooray! According to the EWG, melons are not one of the “dirty dozen” foods that are most highly contaminated with pesticides – in fact, cantaloupe is one of the “clean 15” fruits and veggies that are least contaminated with pesticides; purchasing organic melons is a personal choice. When selecting any type of melon, you want to give the melon a good thump with your fingers. Choose a melon that sounds a bit hollow and that has a fresh “melony” scent to it. Inspect the melon for cuts, bruises and sagging depressions that may indicate rotting or over-ripeness. Cantaloupes and Honeydew Melons should be stored in the refrigerator even if they have not been cut open. Watermelons should be stored somewhere dry and at room temperature until you have cut them. Once cut, either store in an airtight plastic container or wrap plastic wrap over the side that has been cut. Always store cut watermelon in the refrigerator. You may leave all types of melons out on the counter to ripen if need be. Step 3: I suggest mashing or serving soft ripe dices as finger foods. Melons really do not store well in pureed form. Step 4: If you decide to puree the melon for baby food, simply place the dices into your choice of appliance for pureeing and begin pureeing. Step 5: There should be no need to add any extra liquid but you may need to add cereal or another food to thicken up the melon. Step 6: Note: Freezing in dices will make for less waste and enable you to pop out a few dices for a soothing cool treat in a baby safe feeder. Creamy Melon Salad – Mix in some yogurt to make a creamy melon salad that baby can pick through to exercise that pincher grasp! Can Cantaloupes or Melons be frozen for baby food? Cantaloupes and other Melons should not be pureed and then frozen. Freezing a melon puree will give you a thawed product that is gritty and not very tasty at all. You can however freeze melons in large dices. There will be minimal change in texture and taste when melons are frozen in dices.